Many times the business organisations have to maintain a range of software solutions for each function and employ resources to update those systems. Since backend operations have a lot of processes to take care of manual data updations in each system is a huge task! Manual data handling has the risk of errors and duplications. Uniware is one such complete operations management solution that seamlessly integrates with various functions and ERPs in an organisation. This e-commerce solution is designed to assimilate and share process data without error or duplication on all the other existing ERP platforms. The Uniware is feature rich. You can update your GSTIN, GST tax class, and HSN codes in Uniware. You can access GST ready invoice templates for B2B and B2C businesses. You can upload signature in the Uniware solution. You can fetch marketplace invoices with their invoice series and date of creation in Uniware. 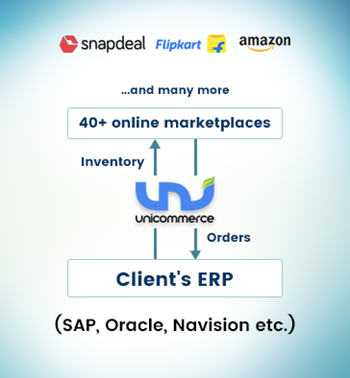 Uniware is an e-commerce solution that has an inbuilt ecosystem to impeccably capture the online business information regarding orders, inventory, returns, shipment etc. across 40+ marketplaces into your existing ERP ( Navision, Oracle, SAP and any other). The Unicommerce’s retail operations software pushes the inventory from an ERP to online marketplaces and reflects actual inventory available for sale. The orders from the marketplaces instantly reflect in your current ERP or an accounting software. A single Unicommerce panel integrates and processes all the online orders from various marketplaces. Uniware offers unrelenting flexibility in centralising inventory across online, offline and website locations in real-time. We understand how important it is for your business to be able to manage operations data in a simple yet realistic way. Get a free trial version and validate yourself how Uniware enhances the efficiency of your business system.